Note, sorry about the length. I attempt to keep this is 7-9 minutes, but today’s readings were 6 mins by themselves and it was a grab bag of thoughts. If you have any I’d love to hear them or if a different section of the grab bag I skipped struck you just leave a comment. 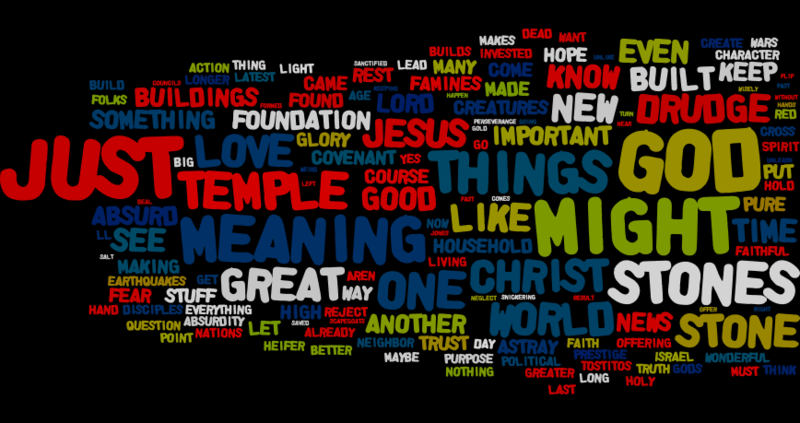 Okay, I’ll admit that this is one of my geekier sermons. Although I think even if you completely don’t get what I’m talking about in the middle, the introduction and the application or gospel in the world section work. Why this is so geeky is because it is an attempt to identify something that we are dealing with but has not been completely defined to the point of say “well duh”. Trying to compress it I think our society has a hard time believing anything. That unbelief is not you garden variety doubt, which I would label as just part of the Christian life. The older saints would call it poetically a dark night of the soul. Thomas doesn’t doubt, he believes something else entirely. He believes is wood and steel and Roman power and his senses and dead things stay dead. When Jesus appears the command is not stop doubting and believe, but stop the unbelief and believe. Now I said Thomas believed in something (wood and steel, cross and spear, the marks in the hands and the side), but belief in idols is no belief at all. Idols have no real existence, so belief in them is unbelief. Jesus tells Thomas, to stop the idolatry. And that is our problem. Our old idols of nation, race, ideology and even church have failed. And postmodernism has convinced us to not get fooled again. But the problem is that we don’t have a choice. We are contingent creatures. We all rest on something. The default metaphysical dreams are our bellies or nothingness or gussied up mammon and nihilism. Those are the idols of post-modernism. And they are bad ones. 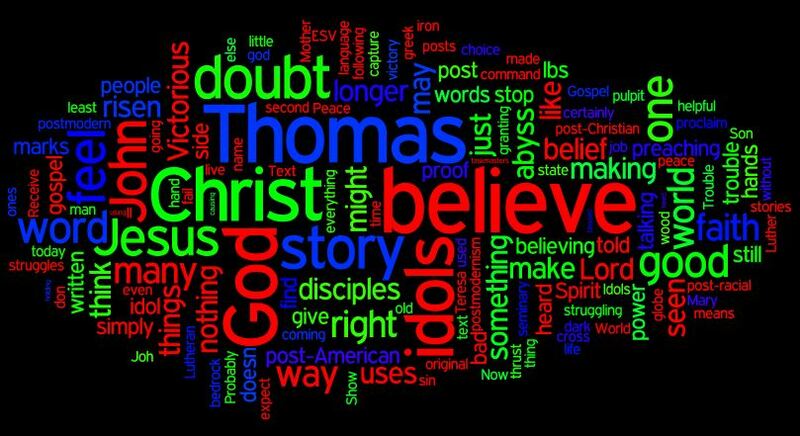 The command issued by Jesus to Thomas caught in both is stop the unbelief and believe. Christ is the true cornerstone that we can build upon. All the old idols have been knocked down, but they have been knocked down so that we might see Christ. Not so that we can find worse idols. One of theses days I’m going to write a novel with that title. It’s an allusion to Gen 31:19,32 and as with so much else from that Ur-Book, its a powerful story that we play out again and again like a musical fugue. The Gospel text for this day is one of those repeats and an appropriate horror story as we get to Halloween. The contrasting character to Jesus is a man who knows he’s trapped by his household gods but can’t leave them. The task of discipleship is to learn to leave them behind. This man’s question is every man’s question or should be. That novel, amongst the characters, the protagonist is the one who in the eyes of the other characters has failed miserably but who is actually the only one who is free. The big struggle this week was the question have I let the gospel predominate. I went back and forth in my pondering about that call to deep discipleship and how it might be taken. It could be a law proclamation of the second kind. All one might hear is the refrain to give up the idols and the application to do more and feel convicted. We know the responses when told to do something we really don’t want to do before we are ready to break the fugue. It could also be a law proclamation of the third kind. What must I do? Look at the commandments. That is how God intended us to live. Actually putting requirements back on people seems like a reversal of the gospel. If you are proclaiming the captives free, how then can you put the chains back on? But Jesus didn’t seem to have any such qualms about being explicit. And that gets to a core recognition of the gospel. We can talk about the gospel in those freedom metaphors, but the call to “follow me” is every bit as much the call of the gospel. We can get deep in the Lutheran weeds and get all worried about passive righteousness. We can piously mumble true words about “I cannot by my own reason of strength follow Jesus”. But in the midst of the Christian life there are moments where it certainly feels like a choice. Like the one Jesus put to the rich man. The choice is really do we hear the gospel and walk in the way Jesus has laid out for us, or do we go our own way. 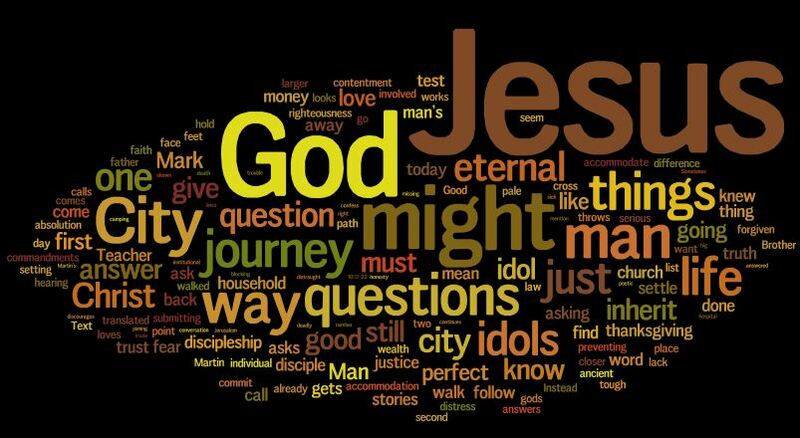 So what I hoped the sermon opened up was not a list of preacher saying you must do x – which would all be great things for the preacher – but a space for the hearer to ask that question – “what must I do?” – and hear Jesus’ answer. These are your household gods and need to be left behind. Whatever they might be. Tagged City of God, City of Man, discipleship, Household Idols, Idols, Mark 10, Mark 10:17-22, Rich Young Rule, stewardship, What must I do?